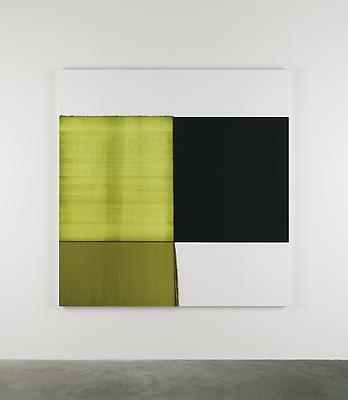 Callum Innes is one of Britain’s best-known abstract painters. His constantly evolving practice is as much about un-painting as it is about painting. Using turpentine in conjunction with oil paints Innes thins and removes layers, revealing underlying colours and leaving the evidence of his process on the canvas. In his ongoing series, Exposed Paintings, layers of black oil paint are gradually removed to reveal a deep violet, or green. In his powerful and evocative series, Monologues the washes create a visual effect like a waterfall or a mist; a natural, shifting phenomenon. This exhibition also shows a selection of works on paper and new watercolours made especially for the Whitworth. Perhaps less well-known than his oils, Innes’ works on paper were some of his earliest experiments in abstraction, and remain an important part of his work today. His ongoing series of watercolours continues Innes’ experimentation with the power of colour, combining pigments to create an often fluid and unclassifiable hue. Throughout his work apparently simple actions create paintings with a complex depth, documents of the process and the duration of their making.